File Types: EPS, JPG, All Files; File Size: 2.17 MB; Vector: Yes. Illustration of a house painter holding paint roller and paint can looking to the side set inside circle on isolated background done in retro woodcut style.The zipped file includes editable vector EPS, hi-res JPG and PNG image. 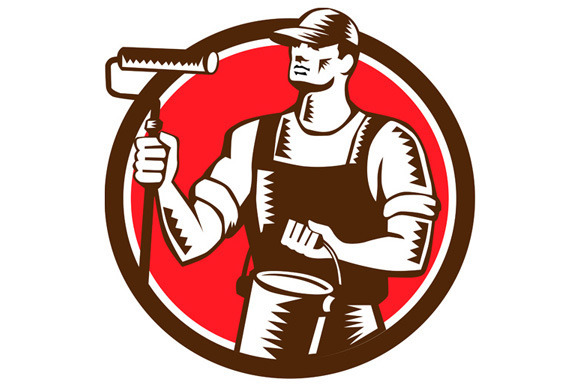 Keywords: house painter, painter, paint roller, roller, paint, paint can, holding, side, worker, tradesman, man, male, handyman, hat, isolated, artwork, illustration, retro, graphics, circle. Best ddsign template, vectors, illustrations, video templates from creative professional designers with After Effect, PhotoShop, 3DS Max, Cinema 4D or InDesign. Full details of CreativeMarket House Painter Holding Paint Roller C 334993 for digital design and education. CreativeMarket House Painter Holding Paint Roller C 334993 desigen style information or anything related.